Is there really a product you can add to the pool to detect urine? Unfortunately, no, it does not exist. This has been a tactic used by savvy parents and grandparents to encourage children not use the pool as a toilet. The fear of getting in trouble,or the desire to avoid an embarrassing situation for children, has perpetuated this myth to be passed down from generation to generation. The real chemical indicators forswimming pool water are designed to detect the levels for five common tests: chlorine, pH, calcium hardness, total alkalinity and cyanuric acid. Chlorine oxidizes any organic material like algae or bacteria in water. The pH is a measurement of whether the water is acidic or basic. Calcium hardness measures the levels of calcium in the water in parts per million. In a pool, calcium levels determine if the water is aggressive, with low levels, or will leave scale with high levels. Aggressive water can etch the surfaces. Total alkalinitylevel measures the buffering ability of the water, or the ability to prevent pH “bounce”. Cyanuric acid level is the amount of stabilizer in the water. The stabilizer acts like sun block for the water, preventing the residual of chlorine in the water from being burned up by the sunlight. 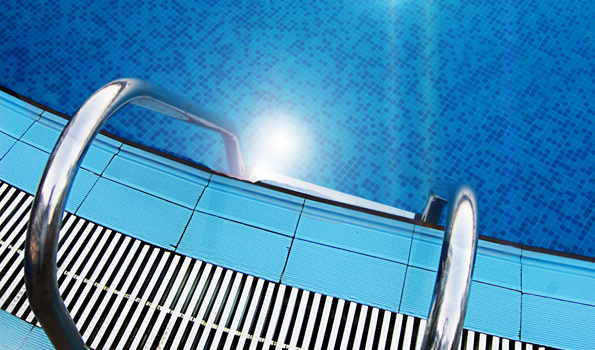 The proper stabilizer levels can greatly extend the amount of residual chlorine in the water. This can save a lot of money by reducing chlorine usage. When all five tests are conducted and the water has been properly adjusted, it doesn’t take much effort to maintain these levels. For homeowners, I would recommend testing and adjusting the pH every day. At public and semi-public pools, this is usually done every hour. I would conduct the remaining three tests (calcium, alkalinity and cyanuric) weekly until you have made adjustments and retested to where you have achieved your desired levels. Then you can test a bit more infrequently, like twice a month. Once you have the water where you want it, adjustments should be minor, especially if you have a cartridge filter. Sand filters use your chemically-balanced pool water for cleaning purposes, essentially flushing your chemicals down the drain. The make-up water will need more chemicals added to get back in balance. Test strips are convenient, but liquid test kits are more precise. The liquid test kits are also more expensive, but usually offer more detailed information as far as desired levels and quantities of chemicals needed to make the required adjustments.To be accurate, you will need to know the volume or total gallons of water in your pool. By focusing on these five levels and keeping them within the proper ranges, you too can have sparkling swimming pool water as long as your pump and filter are working as they should. But don’t tell the kids about this; just be sure they know what happens if they “go” in the pool.